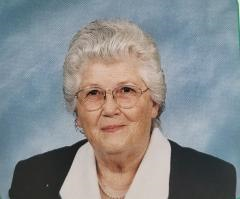 Deva Jean Jones, age 94, of Waynesburg, Kentucky, passed away Friday, March 29, 2019. Born Friday, May 2, 1924 in Casey County, Kentucky, she was the daughter of the late Matthew and Amanda Bastin Caudill. Deva attended Double Springs Baptist Church, she loved to cook and enjoyed planting and taking care of her flowers. Deva leaves behind her loving husband, Robert Jones of Waynesburg; one daughter, Robin Dalene Estes of Waynesburg; step-daughter, Cynthia Kay Durham of Cincinnati, Ohio; two sons, Maurice Dale Fair of Corinth, Kentucky, Danny Keith Jones of Waynesburg; step-son, Jimmy Jones of Kings Mountain, Kentucky; five grandchildren, David Fair, Michael Jones, Stephanie Jones, Clay Estes and Aaron Estes; five great grandchildren, Sierra Smith, Khloe Long, Lillian Berry, Chase Fair and Sierra Fair; one great great grandchild, Maddox Fair; and two sisters, Effie Marie Sims of Kings Mountain and Mary Nancy Moore of Cincinnati. In addition to her parents, she was preceded in death by two brothers, Otha Ray Caudill and Franklin D. Caudill; and two sisters, Edna Mae Ware and Darlena B. Broady. A Private Burial will take place on Monday at Piney Grove Cemetery. Barnett, Demrow & Friend Funeral Home, Waynesburg, is entrusted with Deva’s arrangements. Guest Book available at www.friendfuneralhomes.com.